It was at the very beginning of my martial arts "career" that I first heard the expression: "southern fist, northern leg". 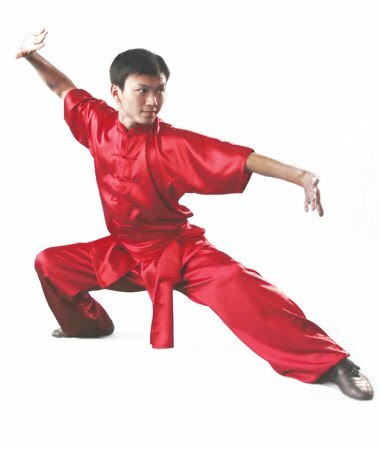 The concept, as I understand it, is that southern Chinese martial arts emphasise hand techniques rather than leg techniques, while northern systems have the reverse emphasis. This is not to say that southern systems do not use kicks or that the northern systems do not use hands; it is just a matter of degree. And more to the point, it has less to do with the use of actual body parts, and more to do with range. What I take the saying to mean is this: southern Chinese martial systems are designed for fighting in close quarters, while northern Chinese systems are designed for fighting at a greater range. It is important to note that by "greater range" I do not mean to imply "distance fighting". Distance fighting is commonly seen in sports combat - where fighters will predominantly launch attacks from outside what I call the "melee range" - ie. the range where you are capable of landing (and being hit by) a punch, strike or kick. I have previously detailed my view that most, if not all, traditional martial arts systems in China and Japan/Okinawa are designed to operate exclusively within the melee range. This is inherently because these arts are civilian defence systems. Most civilian defence scenarios begin and end in the melee: they don't (or shouldn't) involve sport/prizefighting dynamics where 2 opponents circle each other looking for openings. Nor should they depend on protracted ground grappling. Civilian defence tactics focus on a quick exit strategy and assume attackers might be armed, in company or both. So while southern and northern Chinese systems might be designed for different ranges, I don't think they are all that different; they still function within the melee. It is just that southern systems function principally in the inner part of the melee range (mid-range punches to elbows, with the occasional foray to short, low kicks) while northern systems function principally in the outer part of the melee range (full extension punches and kicks). Examples of southern Chinese systems that are designed for close-quarter combat would include wing chun, bak mei (white eyebrow), Yong Chun baihe (white crane from the town of Yong Chun), ngo cho kun / wu zu quan (5 ancestor fist) and southern preying mantis. Examples of northern Chinese systems designed for fully extended kicks and punches include the many forms of changquan or taizu (long fist), northern preying mantis and the internal arts of taijiquan, baguazhang and xingyiquan. Very early in my training I was also told that Okinawan karate has its own division, akin to the northern/southern paradigm in China: Karate can be classified as either Naha te (from the city of Naha) or Shuri/Tomari te (related systems from the towns of Shuri and Tomari that are often collectively called the "shorin" systems). Naha te and the southern "Chinese connection"
Uechi ryu in particular has a strong resemblance to Yong Chun baihe. The kata tensho from goju ryu is also reminiscent of the Yong Chun form ba fen. Even the Hakka systems that do not have a sanzhan form utlise a stance that is clearly related: their principle fighting stance is clearly a sanzhan variant. 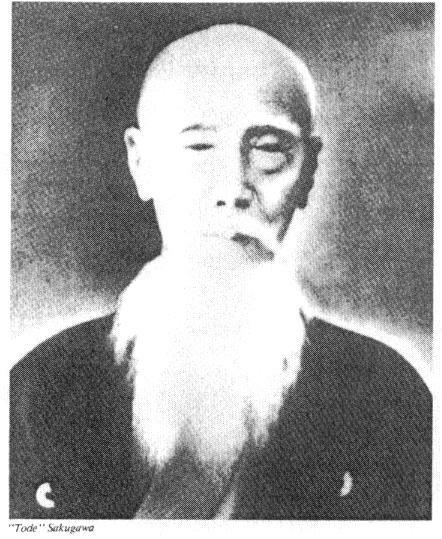 To my mind, even wing chun's "A" stance owes its origin to sanzhan - or at least a sanzhan ancestor. 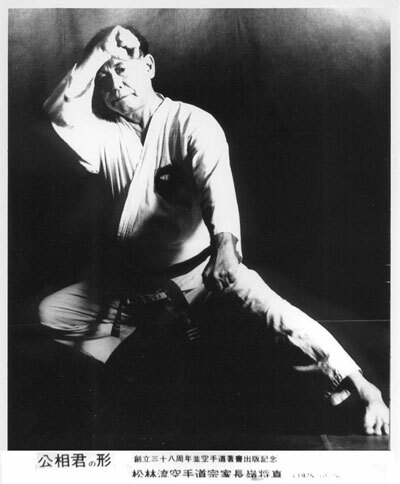 Another key indicator of Naha te's southern "Chinese connection" is the frequent use of neko ashi dachi - the cat stance. In fact, many Yong Chun and ngo cho kun / wu zu quan forms finish in neko ashi dachi with a tora guchi (tiger mouth push) - just as goju/ryuei/tou'on ryu forms do. The shorin systems all trace their roots back to Matsumura Sokon, a legendary Okinawan karateka. The kata (forms) in the shorin tradition are also said to come from (or have been influenced by) Chinese systems, but arguably from a much earlier period than when the Naha te kata evolved. When I first started training I was told that the shorin systems were derived from the northern Chinese systems and were hence designed for long range fighting (by comparison to the Naha te systems). So in summary, I used to think that the Naha te systems were designed for close-quarters combat while the shorin systems were designed for the longer-range fighting. It seemed that the "southern fist, northern leg" principle was mirrored exactly in the little island of Okinawa. Is there really a "north/south" paradigm in Okinawan karate? Just how accurate is this apparent north/south dichotomy as regards Okinawan karate? We have some evidence that Naha te has links to southern Chinese martial systems, but are the shorin systems really from northern China? Indeed the standard, full extension, corkscrew punching of shorin forms, the emphasis on zenkutsu dachi (forward stance) and shiko/kiba dachi (horse stance) are reminiscent of changquan/taizu and even taijiquan. But then again, all these elements also feature to a greater or lesser extend in Naha te. Moreover, many "hallmarks" of Naha te are present in the shorin systems. For example, sanchin dachi and neko ashi dachi, while not as frequently used, do appear in many shorin kata. And it seems that this not simply due to "cross-pollination". I have previously discussed the kata seisan which appears in both the Naha te and shorin traditions and which existed in Okinawa long before the travels of Higaonna Kanryo, Uechi Kanbun and Nakaima Norisato to China in the late 1800s. As Mario McKenna5 points out, there is strong evidence that karate (in all its incarnations) owes more to local innovation than any direct lineage to China. I think it is unlikely that the northern Chinese martial systems had any impact on the evolution of the shorin schools of karate. Remember that in the 18th and 19th centuries travelling to and from China's north to Okinawa was no easy task. I very much doubt that Okinawans had the chance to meet northern Chinese martial artists - at least in any significant number. And while is said that Matsumura studied quan fa in China 6 there detail or evidence concerning this. As a servant of the royal court in Okinawa, he might also have been exposed to official visitors from Beijing - some of whom might have been versed in the northern Chinese martial arts. But again, there is little to corroberate this. In the end, I suspect that if the northern systems had any influence on karate, this influence was, at best, slight. And whatever the impact of northern Chinese influence, this has probably been passed down to karate generally - not just the shorin school. For example, such generalised influence might explain why Okinawan karate, as a rule, uses the fully extended corkscrew punch and not the vertical fist punch of, say, wing chun. Then again it might not. The corkscrew punch might have had a parallel evolution to that in northern China - especially if (as I have previously argued) it is just a manifestation of natural arm movement / efficient biomechanics). Are there differences in range between shorin systems and Naha te? Irrespective of any "northern" influence or lack thereof, it is my view (based on my own experience with various styles of karate) that the shorin systems are designed to operate at a longer range than the Naha te schools. One example of this is the use in shorin forms of the kokutsu dachi (back stance) - an elongated stance often used in Ryukyu kobudo (weapons) and suitable for fighting at a longer range. Another is the relatively greater mobililty required for shorin forms than some of the Naha te kata. These differences are however quite slight, and vary depending on the kata being examined. Goju kata such as seiunchin, shisochin and seipai have movement which could quite easily be found in a shorin kata. The goju/tou'on/ryuei ryu versions of sanchin, sanseiru and seisan katas - and any uechi ryu katas - are a different kettle of fish altogether. They appear to be structured for a much closer range of fighting, with little body movement (taisabaki) relative to other karate kata. Modern karate and "distance fighting"
But to my mind, the biggest differences arising in today's karate "operating range" come not from any such historical design issues, but from modern influences. Many karateka today are what I would call "distance fighters". Distance stylists typically don't stay within the melee range - they enter only to land a blow then move out. This means their preference is to evade attacks without deflection, not deflect them with evasion. I see this trend in modern off-shoots of the shorin school such as shotokan and taekwondo, and also in some Naha te descendants - eg. goju kai. It is my view that such "distance karate" has evolved due to the influence of competition kumite and western boxing - disciplines where the competitors spend only a fraction of their time in the melee range - usually for a brief, furious exchange. I'm not going to say distance fighting doesn't work as a strategy. Far from it. I've faced enough good shotokan and other "distance fighters" to know how potent their approach can be, while fighters like Lyoto Machida have shown that a distance strategy can work well even in the MMA arena. However it is my contention that karate, as a traditional far eastern martial art, was never intended to function this way. I say this chiefly due to the preponderance of "blocks" (better called "deflections") in both karate and the Chinese martial systems. As I have previously argued, deflections are vital in the melee range - yet they are rarely, if ever, used in distance fighting. This has resulted in the (to me, incongruous) position that "distance fighting karateka" will often practice standing blocks/deflections, yet never apply them once in sparring. The above observation does not mean that karateka who train this way are not getting benefit from their deflections etc. I'm fairly certain that they use these basics for developing kinaesthetic awareness, kime etc. But I feel that they can (and should) be so much more. They can be applied in sparring - and in civilian defence. I very much doubt that the maxim "southern fist, northern leg" has any real application to Okinawan karate. Karate, in all its incarnations, is most closely related to the southern Chinese martial traditions. And even then, there is a scarcity of evidence linking karate forms to anything that ever existed on the mainland. In other words, karate, while subject to the influence of (particularly southern) Chinese martial arts, appears to be principally an Okinawan innovation with no direct "lineage" to any system of Chinese quan fa. Regardless, Naha te and the shorin tradition do appear to function in slightly different ranges, with the former having a greater number of "close-quarters" techniques and the latter having a greater number of full extension techniques. However these differences are really quite slight when karate is examined overall. And they do not account for the more recent trend in karate towards "distance fighting". 1. Bishop, M. (1989). Okinawan Karate - Teachers, styles and secret techniques. London. A & C Black Ltd.
2. See my series of articles commencing with "The origins of goju ryu kata: Part 1". 3. See Joe Swift's article "The Kempo of Kume Village" in Meibukan Magazine No. 6. 4. See my article "Sanchin in Chinese martial arts". 5. See Mario McKenna’s article “So what did you think you were doing”. 6. See Mark Bishop's book at footnote 1 and also the wikipedia entry on Matsumura Sokon. 7. See this site for a history of Sakugawa Kanga. 1) There is (reportedly) a marker to commemorate Sakugawa from the early 1800s somewhere in Beijing. Having not seen it, I cannot verify this, but I have been told by multiple sources, a few of whom have been to China. 2) Emissaries from China would likely have been relatively high ranking officials. If one did stay for a period of time, he would have likely been from a northern province as a) the Qing dynasty generally favored Manchurians for political office, who were often from the North, and b) even non Manchurian emissaries generally would have been sent from the capital, not from closer southern provinces, no matter how convenient the latter might have been. As emissaries might well have sat the military exams as well as the civil service exams (this is supposedly not uncommon among upper class families), and these emissaries would certainly have had body guards, exposure to Northern Styles, especially within the court, does not seem unlikely. Yes, I too remember hearing that emissaries from China were from Beijing and that they were trained in martial arts. I suppose this does support some northern influence on shorin ryu. 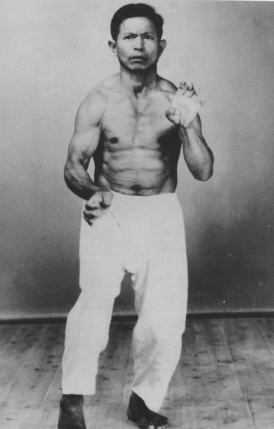 Baji quan is a considered the "body guard style" and it's definitely northern although it looks southern in some ways. The oi-zuki/chasing punch (I found in Nagamine's book Essence of Okinawa Karate-Do) seems to be similar to side thrusting punches used in baji. Punching while stepping forward is different than baji but shares some of the dynamics with northern styles such as power through momentum in Xingyiquan. 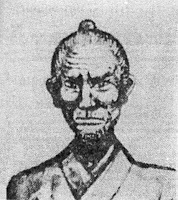 Wari-uke-zuki is very similar to pao quan from xingyi, but I think all this is beginning to split hairs. There is also the chance that Shorin ryu recieved these Northern-esque style elements from odd Southern styles. Take Choy li fut for instance. Doesn't Hung gar also have longer, wider movements as well? Look at hung gar's Tiger-Crane form. These are all possibilities I think. Shorin's natural stances and alignment could have been it's own development within Shuri and Tomari. Some very interesting points Joshua - thank you. As regards choy lay fut and hung gar; I was just speaking with Sifu Vincent Cordeiro a couple of months ago on radio (he is a senior choy lat fut practitioner) and we talked about the obvious northern influence on these styles. However it is my impression (I might be wrong) that the styles don't go back as far as Bushi Matsumura etc. I think the evolution of these styles is (despite any claims as to their lineage) reasonably recent (ie early 20th century, possibly late 1800s). Dan, that's a really good catch. I should have thought of that, considering the recent amount of research I did on CLF. I'm not sure how far back hung gar goes though...but I think you're right, around 1800's. Sokon, being a body guard, probably dealt with weapons often. This could explain range (although Shorin's range isn't long enough for that in all honesty). Again xingyi comes to mind with the correlation between it and spear-craft. I'm sure your right about Matsumura's weapons influencing his unarmed art. I have long seen a close connection between shorin ryu and ryukyu kobudo (from the abundant use of kokutsu dachi, which I see as a weapons stance, through to the style of taisabaki and even the arm movements). The same link is not so apparent when you look at Naha te. But I'm also cognizant of Quint's argument that Matsumura would have been exposed to envoys from Beijing who would have known some northern styles. I suspect the latter left its legacy in such things as the corckscrew punch, but I doubt anyone will ever know. This is a nice overview of how karate evolved over time, brief but comprehensive? I've got a question though. What was the most common type of unarmed fight back in old days on Okinawa? Was it a sudden bar/street fight or a challanged duel out in some open space? And how often it happened meaning what the law was in that time? Patrick McCarthy has views on this. Not being a historian, I can only guess. 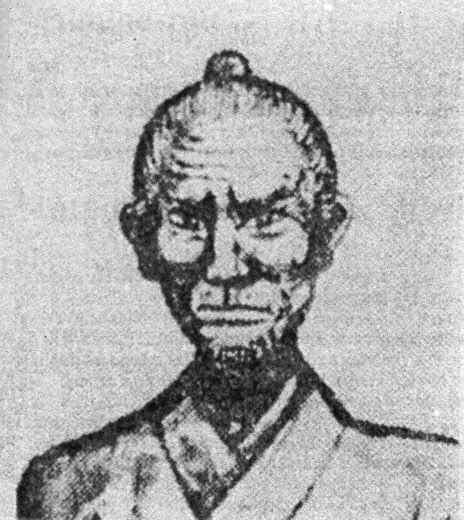 From what I've read (in accounts of people like Funakoshi), attacks would frequently happen in the form of attacks by bandits on the open road (muggings). There would be bar-room brawls (Chokki Motobu is said to have had many). Patrick McCarthy has a theory he calls HAPV which you should look up. It concerns habitual acts of physical violence - ie. common assaults. Mr McCarthy feels that karate and like arts were designed to deal with these common attacks. In any case, from your discussion I'm gathering that the distance-fighting strategy is more appropriate to Taekwon-Do with it's emphasis on kicking, than to traditional Karate with its emphasis on blocking and other hand techniques. This is especially true for WTF Taekwon-Do with its almost exclusive use of kicking, and less so for ITF (which still retains a strong Shotokan arsenal). Thank you for the answer. I'll certainly look into it. By the way, congratulations for the award. You deserve it. First of all, this is a gem of a blog. Very full of insights that can complement and aid anyone's training no matter what art you study. Thank you for sharing your experience and knowledge. Regarding your topic, I have always heard about the "Southern hands, Northern leg" comment from Chinese old timers as a kid, especially from my uncles who trained in Kung Fu. But this is the first time I've heard of the Okinawan version you mention. I had always assumed that the Shorin systems had their origins in and were an offshoot of the Shaolin Temple, since to my limited understanding, the term "Shorin ryu" was Japanese for "Shaolin style". I guess I was mistaken. No, you weren't mistaken. "Shorin" is the Japanese pronunciation of "Shaolin" (at least on one set of kanji). Karate is said by many to have originated from both southern and northern shaolin (as there were said to be shaolin temples in the north and south). Shaolin (or waijia/external) is often used as a generic label as opposed to the wudang (neijia/internal) schools of xingyi, bagua and taiji.